Most people I know outside of the tri-state area (New York, New Jersey and Connecticut) and possibly Chicago, think of a Bolognese Meat Sauce as the de-facto standard pasta sauce. The traditional Bolognese Meat Sauce (Ragú alla Bolognese) is a ground meat-based tomato sauce that originated in Bologna, Italy. Bologna is a northern Italian city south-east of Modena and Reggio Emilia (of balsamic vinegar fame). It’s also pretty close to Parma, the birthplace of Parmesan cheese. My version uses Romano cheese, which is more predominate in southern Italy. We try to interpret the classical or typical Bolognese Ragú style but add personal touches which all families tend to do. Traditional Bolognese sauce is much less tomato based and would use about 1 cup (8 oz) of hand crushed tomatoes rather than the 28 oz we use. It really depends on your preference. We hope you enjoy making your very own family tradition. spaghetti, pappardelle, fettuccine, rigatoni or penne. 1. In a large pot, preheat the olive oil with butter on medium, add the pancetta (or bacon) and cook until the pieces begin to turn brown. 2. Add the onions, garlic and crushed peperoncino fiocchi (hot pepper flakes). Cook for about 2-3 minutes or so waiting until the onion begin to show signs of translucency and the garlic begins to brown. 3. Add the ground beef (veal, pork or a combination). 4. Once the ground beef is browned, add the red and green peppers. Cook for another 5 or 10 minutes until the peppers begin to soften. 5. add the carrots and celery. Cook until the celery begins to turn translucent and the carrots begin to soften. 6. Once the meat, garlic, onions, peppers, carrots and celery are cooked, add some more butter, add the (optional) mushrooms. Cook until the mushrooms are about tender. 7. 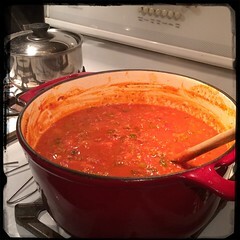 Add the hand-crushed plum tomatoes and the two cans of tomato paste, wait until boiling. 8. Add the the wine, let come back to boil and add then add 1 cup of stock at a time, stirring frequently. 9. Simmer the sauce until it begins to bubble and then add the grated cheese (it’s traditional to use Parmesan but we prefer Pecorino Romano) . 10. Add the sugar, salt, pepper and grated cheese. 10. Let simmer 1/2 hour or for an hour or so. Stir frequently and liquid stock as required.